Cut a piece of baker's twine (or any string) long enough fit around the fabric you need to gather and then some. You want about 4 inches of hangover where you start and also where you finish. 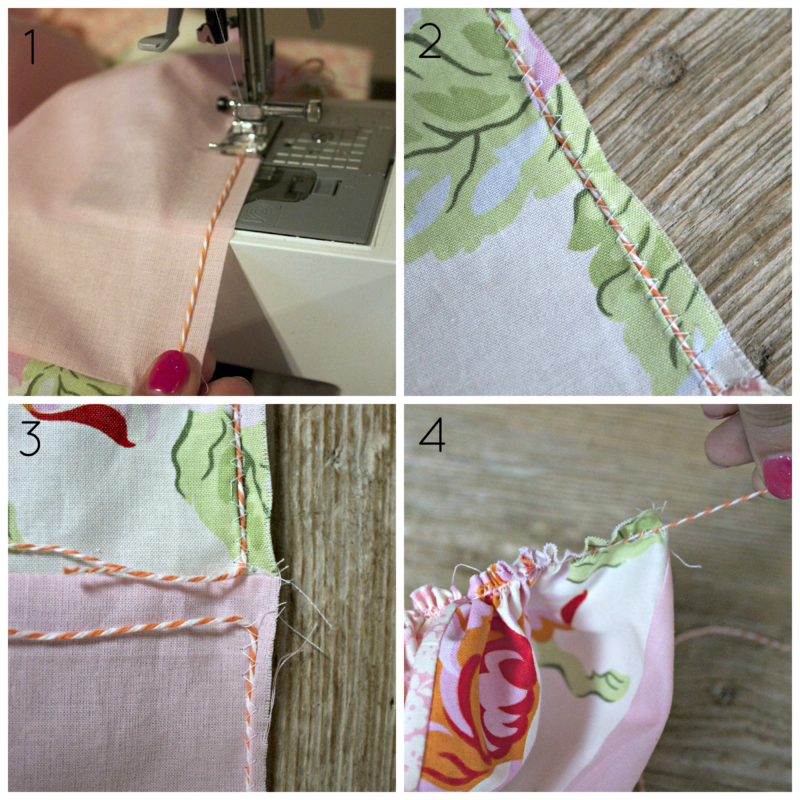 Set you sewing machine to a zig zag stitch and make the width and length or your stitch long enough to sew over the baker's twine with out actually attaching it to the fabric. I set mine to a 3 length and a 6 width. Hold your string in place and zig zag over it (photo 1) leaving about tail of about 4 inches of string where you start. Don't rush and get it close to the edge. It should look something like photo 2 when you're finished and as shown in photo 3 leave another tail where the end. Then simply pull the string while pushing the fabric in the opposite direction. It's almost impossible to break the string so you can be as aggressive as you'd like. Once you've sewn your gathered piece to the rest of your project, just pull the string out and save it for next time. Wow, this is one of those, "Why didn't I think of that?" moments. You've just made my life simpler, because I DREAD using the basting stitch-it breaks, snags, snarls, pulls unevenly, bunches when you start trying to sew the gathers, etc., etc. THANK YOU! LOL! Great idea to use bakers twine!! blog in 3 completely different internet browsers and I must say this blog loads a lot faster then most.